Two painters, two complimentary styles, yet two very different lenses onto the world around us. In Specially Normal (29th of March–28th of April 2018), Kristin Hjellegjerde will present new works by Norwegian Audun Alvestad and Spanish Cristina BanBan. While their painterly portraits of people may at first glance appear similar in their depiction of the everyday, these two oeuvres embody distinctly different approaches. What unites Alvestad and BanBan is an interest in everyday life. They each depict “normal people doing normal things”, as BanBan explains. However, what at first glance appears quite similar, upon further examination reveals quite stark differences – and not just in aesthetic style alone. Indeed, Alvestad and BanBan’s approaches appear almost inversely complementary to each other – for where Alvestad focuses on the painting process itself, with the narrative providing a secondary, not primary function, for BanBan, the painting begins with the narrative, which then unfolds through the process of paint. As such, Cristina BanBan’s paintings are characterised by a fleshiness, a sensuality evident in the bulkiness of thighs and arms balanced out by serene and delicate rosebud mouths and dainty faces, the eroticism of large, pendulous breasts juxtaposed with the serenity of quiet moments. Placing characters in intriguing quotidian situations – going for a run with a friend, taking a bath with a lover, a bowl of carbonara interrupted by a flashing phone – allows the viewer a snapshot of an everyday moment in time. Yet there is the ever-pervading sense of a wider backstory at play. BanBan focuses on feelings, individual stories and relationships, representing emotions and a subject’s environment. This is enhanced through a clever interplay of texture and colour. “Instead of a realistic colour representation, in these new works I’m putting an emphasis on the way each colour works independently outside the figure,” she explains. 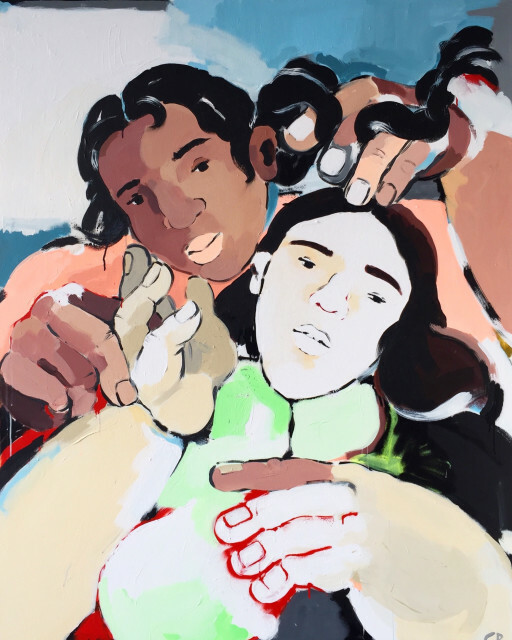 In this new series, we also witness BanBan move through a process of experimentation, her figurative paintings taking on subtler abstract elements, while maintaining their characteristic realism. It is this sense of simplicity that, ultimately, provides the true common ground in which Alvestad and BanBan meet. For it is in this arena, where both painters allow the viewer a snapshot into a tantalising world in which the banal is celebrated, the everyday alludes to exciting possibilities, and the stories we are inspired to investigate in our heads provide countless narratives. Cristina BanBan (Barcelona, 1987) lives and works in London. She is a painter known for her colourful and figurative work depicting large human bodies and individual narratives. BanBan obtained a BA in Fine Arts from the University of Barcelona and was recently awarded the Arts Club Prize from the Summer Exhibition at the Royal Academy. Recent group exhibitions include the Griffin Art Prize, Griffin Gallery; Candy, The Dot Project and Inside Out (curated by Gavin Tur), Hear East (all London, UK, 2017). Solo exhibitions include Richer House, Miscelanea, Barcelona, Spain; A Spoonful of Charcoal, Stour Space, London, UK (both 2017) and Pounds for Bread, Unit G gallery, London, UK (2016). Her work is held in private collections in the UK, the US, Spain and Brazil. Audun Alvestad (Aalesund, 1980) is a Norwegian painter who received his MFA form the Kunsthogskolen i Bergen in 2016, after studying at the Det kongelige Danske Kunstakademi, Copenhagen (2015) and receiving his BFA from the Kunsthogskolen I Bergen, Avd Kunstakademiet (2009). Group exhibitions include We are the ones..., Carlsberg gallery, Copenhagen, Denmark; The Summer Island Show, Gallery Kant, Denmark and Hostutstillingen, Kunstnernes Hus, Oslo, Norway (all 2017), with solo exhibitions including Varme Hender, Kalde Fotter, Trondelag Senter for Samtidskunt, Trondheim, Norway, and Klamme Hender, Varme Fotter, Gallery Christinegaard, bergen, Norway (both 2017). He was recently awarded a three year working grant for young artists by the Arts Council of Norway. Kristin Hjellegjerde opened her eponymous gallery in south west London in June 2012 following her move from New York. Kristin Hjellegjerde showcases cutting-edge contemporary art from emerging and established international artists, with the central concern being to create an intimate space in which artists can present a coherent body of work within a focused environment. Drawing on her own international background, Kristin Hjellegjerde seeks to discover and develop new talents by creating a platform through which they can be introduced to local and international audiences and by allowing for artistic exchange. Kristin Hjellegjerde also acts as an art advisor for both emerging private and corporate collectors. The gallery will expand to a new Berlin space in Mitte in April 2018. Kristin Hjellegjerde will also be curating Vestfossen Kunstlaboratorium’s summer exhibition 2019. For more information, visit www.kristinhjellegjerde.com.